Survey: Energy is changing faster than our power grid can keep up, say our experts. The United States has a serious problem it’s not dealing with, America’s energy experts want you to know: The power grid that keep our lights on and powers our economy is woefully behind the times, unready for the huge changes already underway in the energy sector. For The Agenda: Future of Power, POLITICO surveyed 47 energy thinkers from across the spectrum, from the coal and oil industries to green-energy startups. The group included former EPA administrators Christine Todd Whitman and Carol Browner; energy and economic officials for Presidents Bush and Clinton; the environmentalist Bill McKibben and the chairman of Washington Gas. The US Department of Energy even filled out its own survey. The overall picture our experts drew is of a nation whose power mix is changing but whose infrastructure isn’t keeping pace. Dirty coal plants are shuttering, wind farms are sprouting up, and cheap and plentiful domestic natural gas is on the rise as a source of the electricity that keeps our nation humming. What this means, though, is that the aging power grid will need to be ready for widely distributed generation – for a world in which electricity flows through the wires not just to consumers but from them. And the grid, as it gets smarter and more networked, but also more widely distributed, will be increasingly vulnerable to security threats. Without prompting, several leaders raised this red flag. On the policy front, the biggest question now hanging over the entire power industry is Obama’s Clean Power Plan, expected this summer, which will create a new set of carbon-dioxide emissions goals for states – America’s first national carbon policy. Opponents have complained it will create toxic regulations and needlessly cripple legacy fuel industries. But our panel didn’t seem worried that the Clean Power Plan would be quite that disruptive. One key takeaway: Don’t expect the plan will survive just the way the White House writes it. Mitch McConnell has already launched a legal fight and a state-by-state campaign to rally governors against the new regulations, and although almost no one thinks he’ll succeed in torpedoing the rules completely, more than half of our respondents did think he would hobble their effects. Who will win in the long run? A slight majority – 56 percent of our survey – was confident a Republican win in 2016 would lead to the rollback of the EPA rules that are pushing coal out of the power mix. And although fully 51 percent thought climate change would still be debated in America 15 years from now, a slightly larger number, 59 percent, predicted the US would adopt a cap on greenhouse gas emissions by then. But energy is a long-term proposition, not just a question for the typical campaign cycle. Energy and climate goals tend to be articulated in decades. When the White House talks about its carbon targets, it focuses on 2030. So we asked our experts about 2030 as well: what kind of country will we be living in? Overall, they envision a country powered by natural gas, coal, and nuclear energy—much the same mix as today, though natural gas is widely expected to overtake coal as the top source of fuel. One powerful conundrum we face: Nuclear power won’t be going away – indeed, the single most definitive answer in our entire survey was the prediction by 91 percent of respondents that America would resume building nuclear plants. 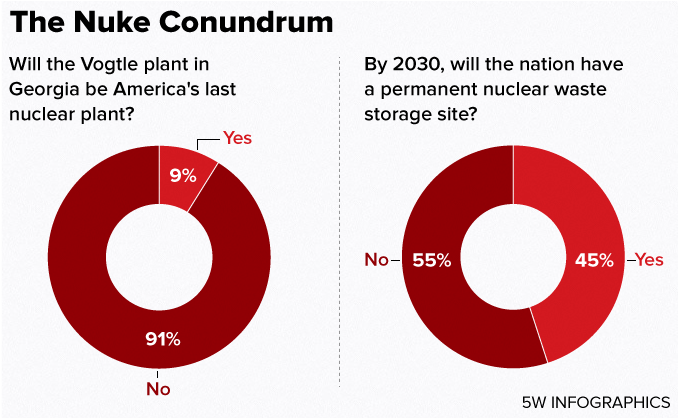 But the biggest challenge posed by nuclear energy still will not be solved: by a slim majority, 55 to 45 percent, our experts don’t expect America will find a long-term site to store its waste. He’s a senior advisor with Colorado-based E Source and the videos serve to help utilities better understand their customers. Through making them, he finds those customers don’t really understand electricity and, usually, most of them don’t really care to. But, as the nation’s electricity grid ages and becomes less reliable, public knowledge will likely play a bigger role in finding solutions. While a company like E-Source is helping utilities gauge customer knowledge about the grid, a new Colorado nonprofit is trying to help customers understand how the grid works. Coloradans for Reliable Electricity gives presentations to Rotary Clubs and Chambers of Commerce, trying to convince them investments in the grid are just as important as investments in roads or bridges. “If we ignore (the grid), if we don’t maintain it, it’s gonna change the quality of life in our country,” said Executive Director Bill Vidal. There are occasions when greater knowledge actually leads to extra roadblocks for utilities. Chelsey Crittendon and her neighbor Casey Lemieux take great pride in their little corner of Thornton, Colorado, a rapidly growing suburb north of Denver. During a recent interview, the two picked up trash from sidewalks and eagerly pointed out the neighborhood’s many green spaces. But, their smiles faded when they reached the end of their block. Right across from Lemieux’s house lies an empty field where their subdivision meets several others. “They want to put a four-acre, 200-kilovolt substation right in the middle of seven communities,” he said. We see substations all over — clusters of what look like steel shipping containers, where power lines spring from big metal coils. They’re usually surrounded by fences and signs showing a stick figure man getting cut in half by a lightning bolt. Utilities need substations every few miles in order to take the super high-voltage power from long distance power lines and step it down so we can use it in our homes. When you get too far away from these substations, electricity just sort of peters out and becomes less reliable. Betty Merzayi, Transmission Planning Manager with Xcel Energy, said that’s starting to happen in Thornton. “We’re already having problems with our overloads on existing systems,” she said, adding the utility has been trying to get a substation built in that neighborhood for about 10 years. Part of the reason it has taken so long is few residents want something like that in their back yards. Crittendon and Lemieux worry about lowered property values, danger to kids, and potential (yet unproven) health effects from long-term exposure to electro-magnetic fields. “Why do they feel they need to build in any neighborhood, not just our neighborhood but any neighborhood?” Crittendon asked. More substations mean greater reliability. These critical building blocks of our electrical infrastructure are not going away anytime soon, even if they are intrusive. Yet, the overall problem is much bigger than this. The grid is old and needs updating — how do you get ratepayers on board with that challenge? Well, there is another technology which could achieve that double-whammy of greater grid knowledge and fewer power outages. Bill LeBlanc of E Source said so-called smart meters in people’s homes instantly tell utilities when power is out in an area.